Wedding Movies – What’s your Favorite? I love movies, comedy, drama, suspense, action – all kinds of movies, even CGI cartoons! The reason I love movies is because they take me to a place that doesn’t exist, except in someone’s imagination, whether it is romance, laughter or thrills. It doesn’t have to be technically possible or factually correct (unless it is a documentary) and as a result, I get lost in someone else’s dream and I love it! In no particular order, I have compiled a list of my favorite wedding or wedding-related movies. The Other Sister. Love comes in all forms. This super sweet romance is also packed with a touch of laugh out loud comedy and drama. Unfortunately, you kind of hate the mom at the end of the movie. In & Out. Comedy, comedy, comedy. There are no less than ten parts of this movie where I actually laugh out loud every time. The Barbra Streisand references are some of the best lines in the movie and Kevin Kline really sells himself in the dance scene halfway through the movie. Wedding Crashers. The only thing I love more than a super-elegant, East Coast, society wedding is some really raunchy and inappropriate humor. This movie has both…. and a touch of Will Ferrell. Monster-In-Law. I can relate to this mother’s plight, “There is no one good enough for my son”. But, the levels she goes to embarrass and provoke this poor unsuspecting bride are above and beyond even Norman Bates’ mother. Ridiculous? Yes! Loved it? Absolutely! Mamma Mia! Bad singing, some outrageous outfits, unbelievable scenery and ABBA. I forgive you, Pierce Brosnan. This movie was cute, funny, and has a happy ending, AWWWWW. My Best Friend’s Wedding. 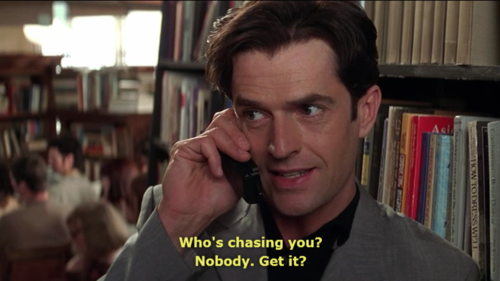 Although the story line bugged me a little (a woman chasing after a man the day before his wedding), the entire movie was saved by Rupert Everett. Rehearsal Dinner scene still one of my all time favorites in any movie, wedding or not. What are your favorite wedding movies ? From the time the engagement ring is on your finger until the honeymoon begins, there are arguments lurking around every corner for engaged couples and if you aren’t careful, you can fall into the trap of ‘agreeing to disagree’. In the beginning, wedding planning is fun; picking out colorful floral arrangements, sampling cake and planning how much fun your friends and family will have together. Then, suddenly you are in the middle of a family squabble over nothing…. literally nothing. 1) Location. He grew up in South Carolina and you grew up in New Jersey but you both live in Chicago. If travel is impossible for one side of the family or another, take that into consideration, otherwise you should have the wedding where you both currently live. 2) Family. There are a million scenarios for the underlying problems of family tension, whether it is a rebellious sibling or an intolerant parent. The best thing to do is put your foot down early and tell them how things are going to work. You may need to remind them from time to time. 3) Prenup. Why are so many people so freaked out about prenups? Because it makes them feel like they are planning a divorce instead of a wedding. In reality, a prenup will protect both of you from yourselves and each other, and family. Decide if you love the person, sign it and be done with it. 4) The Past. Inviting ex-girlfriends/ boyfriends to the wedding may be fine for some and not for others. Don’t be surprised if this becomes a point for an argument later. There are rare situations where this is okay, otherwise – don’t do it. 5)Budget. The thing most couples (married or engaged) fight about is money. Whether you have too much or not enough it is always a factor. 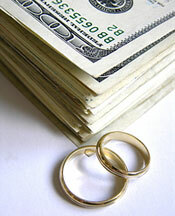 Set your wedding budget, decide early who is paying for what and do not go over the total budget. You may want to cut corners on one thing to splurge on another but, always make sure the bottom line remains the same. Whatever the reason for the disagreement, remember that planning a wedding is like a miniature crystal ball into your future. If you are arguing with his family (or vice versa) now – it will not magically change after you are married, if he is not involved now, he won’t be in the future, if you are both caught between bickering family members, this is the way of the future. The only thing you can do is stand your ground, now and don’t let outside factors interfere with your happiness. Memorial Day is approaching and you know what that means… wedding season is in full swing and by now, many of you are experiencing (or have already experienced) the thrill of your first bridal gown fitting. 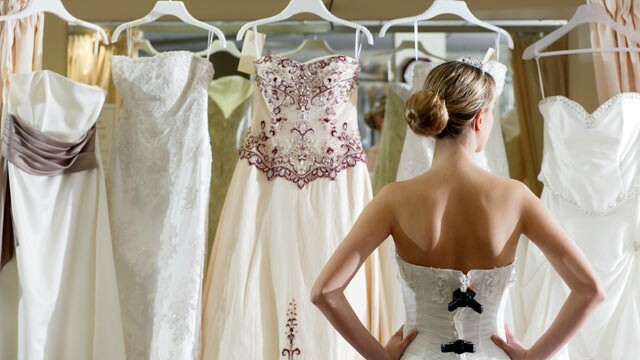 Fittings can be both exhilarating and exhausting, the high and low of your entire wedding gown experience. The alterations process is not something to be taken lightly and you should be prepared for a snafu… or two. Bring a friend. Bringing an objective friend or family member to your fittings will help you answer questions, remember things and stay on top of any problems. This is especially true for the final fitting when you will need some assistance with the bustle, if you have one. This is the perfect task for the maid of honor. Bring your undergarments. Check in advance if the salon has all of the cups, bras, etc that you will need for your particular gown in stock. If they don’t – you will need to bring these with you for your first fitting. Depending upon the style of the gown, this may include special underwear as well. Bring your shoes. Same as undergarments. Some salons carry shoes, some don’t. Even though you may not have the hem of your gown pinned at your first fitting, it is always best to have the shoes with you. Call ahead. Alterations season can be hectic, calling ahead to confirm your appointment is a great idea. Lets face it, things happen; seamstresses get sick, sewing machines need repair, all kinds of things can factor into your appointment being re-arranged. Be flexible. Try to avoid scheduling your alterations appointment when you are in a rush or when the salon is at it’s busiest. Talk to your consultant. Make sure he or she is working when you have your alterations appointments. This will avoid any conversation that begins with “but, my consultant said…” The sales staff at any reputable salon will want to be there for you from beginning to end. Speak up. Don’t be afraid to voice your opinion or ask questions about the alterations process… or the price of alterations up front. If you are uncomfortable with your seamstress, ask to see another one. Now is the time to ask about alterations pricing. Remember your ABC’s…. Always Be Courteous! Even though you had a stressful day at work, the seamstress is there to help you look your best and he or she may have had a stressful day as well. Being polite is essential to a pleasant outcome. Alterations and fittings can be tricky, and stressful. Making sure that you are prepared, informed and relaxed can make the difference between a good, bad or great salon experience. As much as it is their responsibility to uphold their end of the bridal bargain, you must maintain control of the situation from beginning to end. A few months ago we reported a trend that couples are opting for smaller, more intimate gatherings focusing on family and friends. Leave it to Mark Zuckerberg to ‘one up’ everyone by having the smallest, most private gathering of all. Forget that he is a 29 year old billionaire. Forget that he founded the largest, most popular and life changing website in history. He is a young man celebrating love with his young bride, ready to move forward and somehow was able to keep the entire thing secret until the guests arrived. There was no paparazzi, no helicopters, no red carpet – just a simple relationship status change to ‘married’. Disappointing for wedding watchers like me but, also refreshing in many ways! Of course, when I first saw this picture I thought it was photo-shopped. Where’s the hoodie? I mean, here is a guy who is notorious for wearing those darn hoodies to meetings with lawyers and investors… and to ring the opening bell of the New York Stock Exchange so, what gives? As you can tell, he didn’t go for a tuxedo but, instead opted for a demure navy suit. His bride, Priscilla Chan, wore a simple, traditional lace gown that was neither flashy nor strapless. But, I digress…. the expressions on their faces and everything about the picture looked photoshopped ( to me). However, after a bit of snooping around I found this photo which is much more flattering and relaxed. Skeptics will tell you that his matrimonial motive was calculated; getting married after the company went public, IPO’s,community property, inheritance tax, blah, blah, blah. And being somewhat skeptical I would venture to guess that he has his pre-nuptial posterior sufficiently ‘lawyered up’. Maybe he didn’t make the information public because he was afraid of being overtaken by swarms of reporters, maybe he didn’t want the news of his company’s stock to be overshadowed by his own personal business, maybe he was afraid the Winklevoss twins would say it was their idea first. Maybe he just wanted it to be about love and family and commitment… Kudos and congratulations to Mr. & Mrs. Zuckerberg. Wedding Nightmares – What Do They Mean? Having nightmares that things go wrong at your wedding is fairly common, having re-curring nightmares of the same horrific scenario unfolding is less common but, still no reason to be alarmed. Women are more likely to have nightmares than men, so keep that in mind. Some psychologists feel that nightmares are your unconscious mind playing out your secret fears and desires. Only during sleep, when the conscious mind is silent, do these repressed emotions come to the surface and manifest themselves as nightmares and dreams. 1) Being unprepared. Nightmares of this kind can range from moderate to severe: showing up at a random place without a gown or cake or flowers (there are no guests because there were no invitations) feeling lost because they can’t imagine this is supposed to be their wedding. Usually this means you feel like you have lost control of things. Find your voice and make sure your to-do list is appropriately checked off day by day. #2) Not being able to find the groom. He is there, you can see him from across the room but you can’t get to him. When you get to the altar he is not there but, someone is there in his place. Perhaps the wedding plans have taken over, you are not yourself and you have lost touch with the whole reason you are getting married; to spend the rest of your life with the person you love. #3) It’s not you. You don’t look like yourself for any number of reasons; you have gained or lost an enormous amount of weight, you have a unibrow, your hair is unrecognizeable ( not in a good way). In the dream you are confronted with the fact that on short notice there is nothing you can do to alter your appearance to look like yourself. This stems from the tremendous amount of pressure to look good , knowing that you wil be photographed more on this day than probably any other. Don’t put anything off, make all of your hair, waxing, and manicure appointments early and be punctual. Also don’t skimp on hair and makeup for your wedding day. Dr. Sigmund Freud was the foremost aouthority of his time decoding the meaning of dreams, however, even Dr Frued realized that sometimes a cigar is just a cigar. In today’s stress-filled world most psychologists and doctors agree that nightmares generally stem from fear, anxiety and sleep deprivation. Instead of being plagued by doubts, use these nightmares as an opportunity to tie up loose ends, confront your fears and stop them dead in their tracks.